In their opening games of the season, the Varsity Arabians faced Pleasanton and Randolph on August 7th and then competed in the Columbus Varsity Volleyball Classic last weekend. Led by Head Volleyball Coach Leigh Ann McIver, the Arabians are starting their season made up of five seniors, four juniors, 2 sophomores and one freshman. In their first match of the season, the Arabians lost to Pleasanton 1-3. The Eagles won the first two matches 14-25 and 18-25 but the Arabians rallied in the 3rd winning 25-15 however they could not keep up the momentum and lost the 4th match 23-25. Sierra Pompa had two aces and Gabby Rodriguez had one. Madison Pike had 3 blocks, Alissa Stehle 1, and Sana Aaron 1 block. Stehle lead with 29 digs, Rodriguez 26, S. Pompa 21, Macey Hein 17, Sara Moreno 16, Julie Ortiz 15, Pike 3 and Meg Runyan 1 dig. Right after facing Pleasanton, the Arabians turned around and beat Randolph 3-1. Devine won the first two matches 25-16 and 25-23. Randolph turned the game around in the third match and it was a tough fought game with a final score of 26-28. Arabians made quick work of the fourth game and ended the match 25-15. S. Pompa, Aaron, Stehle, Moreno, Rodriguez, Howard, and Hein each had an ace. Pike had 5 blocks and S. Pompa, Aaron, and Runyan each had one block. The team really worked the floor with S. Pompa digging out 24 balls, Rodriguez 21, Stehle and Moreno with 19 each, Ortiz 13, Hein 9, Runyan 6, Pike 4, Aaron and Howard with 3 each, and Zamora 2. In the Columbus Varsity Volleyball Classic, the Arabians went 3-3 against six teams. In their first match against Texas City, the Arabians lost in 2 matches, 20-25 and 23-25. Each match was a tight game and the Arabians made Texas City work for each point. 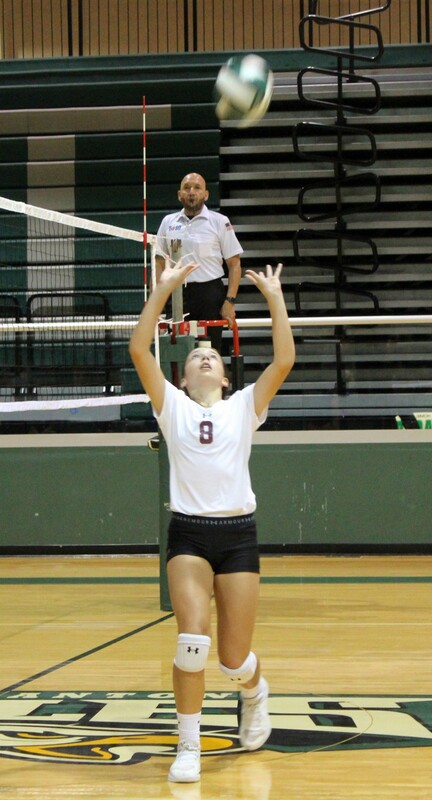 Freshman Macey Hein had 2 aces, 7 digs, and 22 assists as setter. Pike and Aaron each had 2 blocks and S. Pompa had 1. In the second match of the tournament, El Campo fell hard to the Arabians in two matches, 25-21 and 25-20. S. Pompa and Hein each had 2 aces, and Moreno and Rodriguez each had 1 ace. Pike had 4 blocks and one kill, S. Pompa 1 block, 8 digs, and 11 kills, Aaron 1 dig and 1 kill, Ortiz 6 digs, Stehle 6 digs, 2 kills, Moreno 5 digs, Rodriguez 13 digs, Hein 4 digs, and Jasmine Pompa 1 dig. In the game against St. Joseph from Victoria, the Arabians lost 11-25 and 23-25. With 31 digs and 2 blocks, the Arabians made St. Joseph work hard for their wins. Moreno, Howard, and Hein each had an ace. S. Pompa had 7 kills, Runyan 4, Stehle 3, and Aaron 2 kills. Industrial Cobras from Vanderbilt were another tough opponent for the Arabians. Losing 9-25 and 14-25 was tough but the team pulled it together and won their last two matches. Against Industrial, S. Pompa had 6 kills, Runyan and Pike each had 1 kill. Rodriguez 14 digs, Stehle 11, S. Pompa 7, Moreno 3, Ortiz 2, Runyan and Pike with 1 dig each. Devine got into a groove when facing Sealy and won 2-1. Each match was tight with scores of 26-24. 23-25, and 16-14. The front row was much more aggressive with S. Pompa getting 6 kills, Runyan and Pike 4 each, and Aaron, Stehle, and Hein 2 each. The Arabians had 6 aces, 7 blocks, and a team total of 68 digs. Hein had 18 assists. In the final game of the tournament, the Arabians made quick work of beating Brazos 25-13 and 25-22. Hein had 18 assists as setter and with 46 digs, the Arabians made sure to keep the ball in the air. Aaron and Pike each had a block. S. Pompa and Moreno each had 2 aces and Rodriguez had 1 ace. S. Pompa had 8 kills, Runyan 5, Hein 3, Pike and Stehle 2 each and J. Pompa and Aaron 1with one each. “We are still trying to figure some positions out and really gelling on the court since we did graduate a large group of girls. We went 1-3 in Columbus pool play and we were very capable of beating all the teams in our pool. But the girls came out as a different team on Saturday and really showed what they are capable of doing. Our plans for this year are the same as any year, use the pre-season to fine tune any issues we have, win district and advance far in the playoffs. I think once the girls figure out their role on the team and get comfortable with each other some great things are going to happen!” said Coach McIver. This weekend the Arabians will hold their 17th Annual Varsity Arabian Round-Up and then face Bandera on August 21st before heading to the SMH Varsity tournament. District play starts on September 21 against Carrizo Springs.